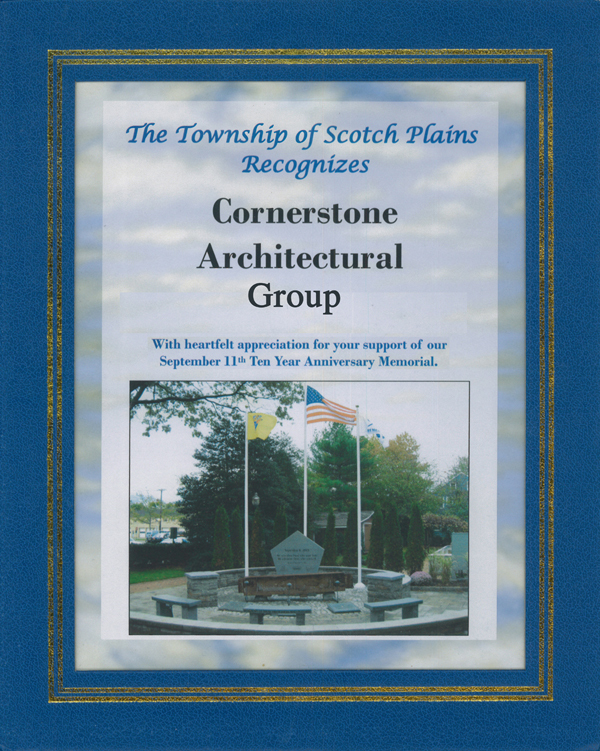 The New Jersey chapter of the American Institute of Architects (AIA NJ) recently recognized Cornerstone Architectural Group for 25 years of service to the profession. 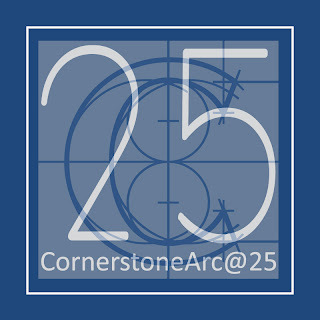 Cornerstone celebrated 25 years in business in December of 2012. 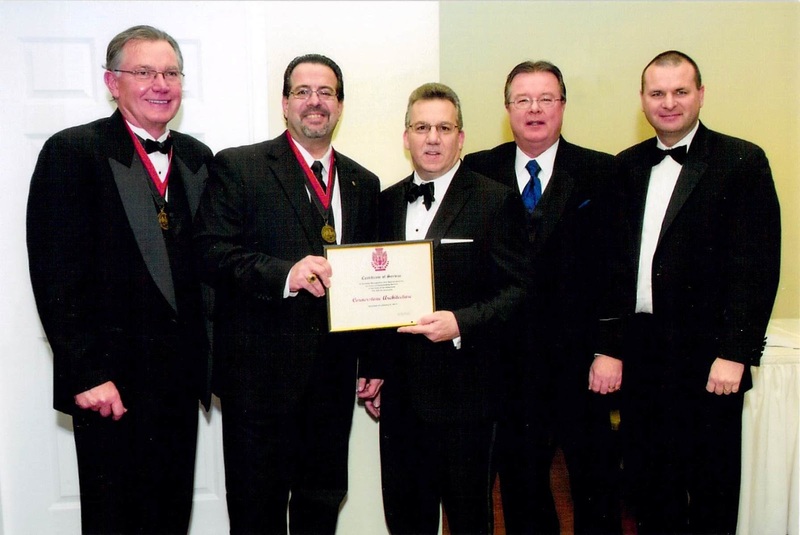 The award was presented to the firms’ principals; Robert F. Barranger, AIA, Robert M. Longo, AIA and Michael G. Soriano, AIA at AIA New Jersey‘s black tie gala, by 2013 AIA NJ President, Jack Purvis, AIA and AIA NJ Service Awards Chair, Michael Hanrahan, AIA. Jim Reinders, an experimental artist with a history of using curious media, became so enthralled by the beauty of the famous Stonehenge in England that he had to recreate it. However, Reinders, instead of using stone, decided to embrace a more modern, Americanized approach. Shortly after his father died in 1982, Reinder came up with the idea to build “Carhenge”. Completing the sculpture just in time for the Summer Solstice, the family celebrated their achievements. 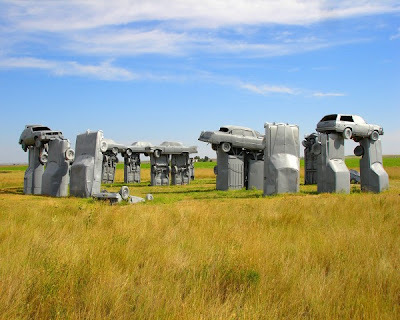 The local residents of Alliance, Nebraska were initially disturbed by the presence of Carhenge, believing it to be an eyesore, but over time have grown to accept and love the structure that put their town on the map. Toms River, NJ Planning Board members have given their approval to an ordinance amendment that will waive the maximum height restriction for homes impacted by Superstorm Sandy. Relaxing that rule for those affected will allow them to raise their homes above 35 feet to satisfy FEMA flood guidelines while bypassing a trip before Toms River’s Zoning Board, so long as no other alterations are proposed. 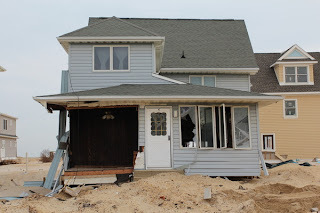 With all of the troubles many residents face as they try to rebuild after Sandy’s devastation, the relaxing of the height requirement for them is meant to make the recovery process go more smoothly, since they won’t have to appear in front of the Zoning Board for a variance. Most of the affected homes likely will require an increase of 4 to 5 feet to meet FEMA guidelines. Raising of homes will not affect disabled residents who require a ramp to access their structure as they are exempt from setback requirements. The challenge will be that they will need landings, and that will make the ramps much longer. D.C. Mayor Vincent Gray will release a sustainability plan that calls for tightening up the District’s Green Building Act, modernizing all public housing and public schools, expanding Brownfield redevelopment incentives, introducing a “pay-as-you-throw” pricing structure for waste collection and creating a government-backed loan fund to support new business. The plan, dubbed “Sustainable D.C.”, follows up the Earth Day 2012 release of the Sustainable D.C. Vision, itself a follow-up to Gray’s July 2011 announcement that D.C. should be the “healthiest, greenest and most livable city in the United States.” Drafted over the course of about 20 months, the plan takes the broad goals found in the vision document — in the areas of jobs, development, health and wellness, equity and diversity, nature, climate, food and transportation — and puts 143 specific initiatives behind them. Cornerstone Architectural Group’s Marco T. Migliaro, AIA has successfully completed the rigorous Architectural Registration Examination administered by the New Jersey State Board of Architects. 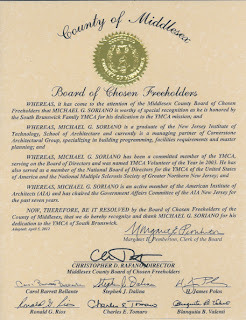 As a newly Registered Architect in the State of New Jersey, Marco now assumes all the professional responsibilities of a licensed design professional. Marco was named an Associate of Cornerstone Architectural Group, South Plainfield, NJ in 2012, in recognition of his many contributions in the management of significant design projects. Marco lives in South Plainfield wife his wife and their two dogs. 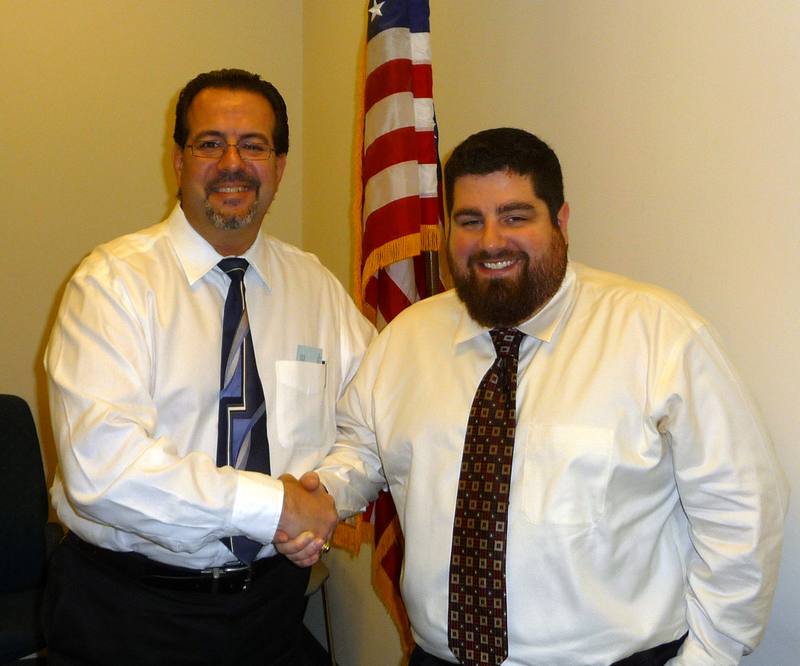 New Jersey State Board of Architects President, Michael Soriano (left) congratulates newly licensed Architect Marco T. Migliaro, AIA (right) at the State Board meeting held on January 10, 2013 in Newark, NJ. 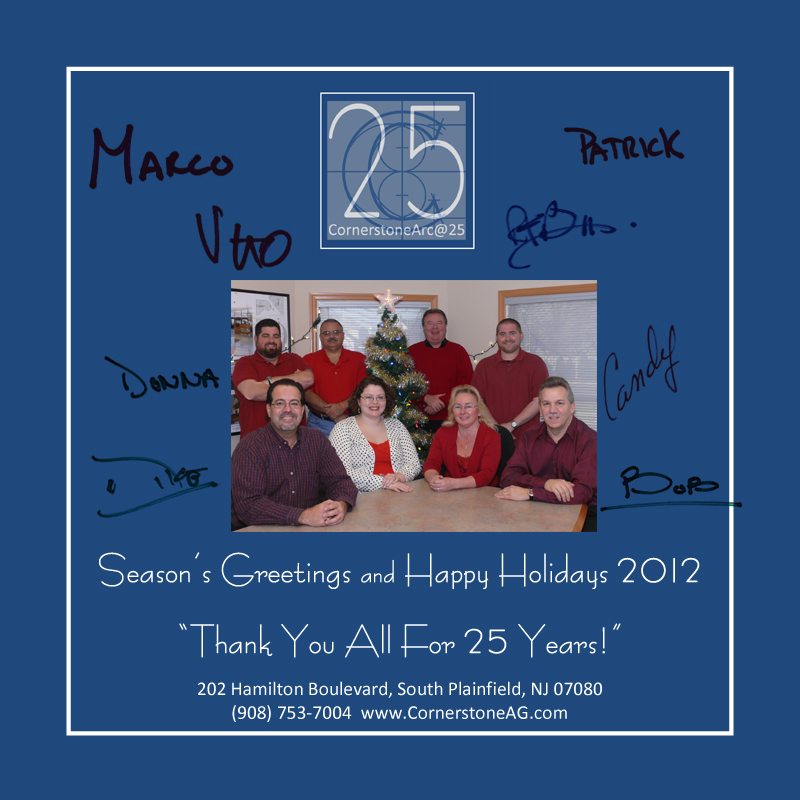 Happy Holidays 2012 From Cornerstone Architectural Group! … and All the Best in 2013!! 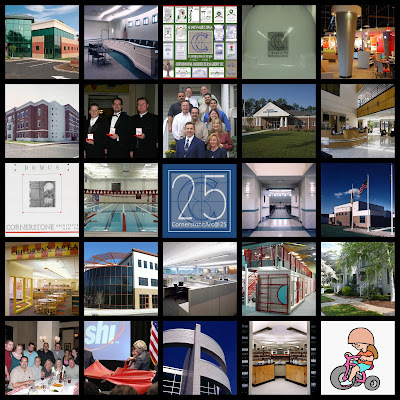 2012 marks the 25th year in practice for New Jersey’s Cornerstone Architectural Group, LLC. We are proud to share this short video celebrating our 25th anniversary, showing you some of our architectural projects and more importantly the people that make up our team. A BIG Thank You to our families, friends and clients for supporting us for the “First 25”! 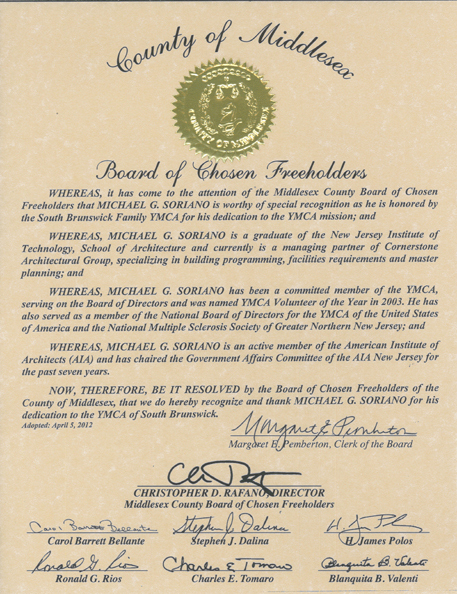 On July 12, 2012, the New Jersey State Board of Architects voted and elected Cornerstone Architectural Group Partner, Michael Soriano as its new President for 2012-2013. The Board operates under the State’s Department of Law and Public Safety, Division of Consumer Affairs. 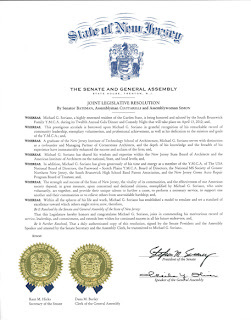 The Board of Architects is responsible for protecting the public’s health and safety by determining the qualifications of individuals seeking licensure as Architects in the State, for establishing standards of practice for licensees and firms, and for disciplining those who do not adhere to the requirements. 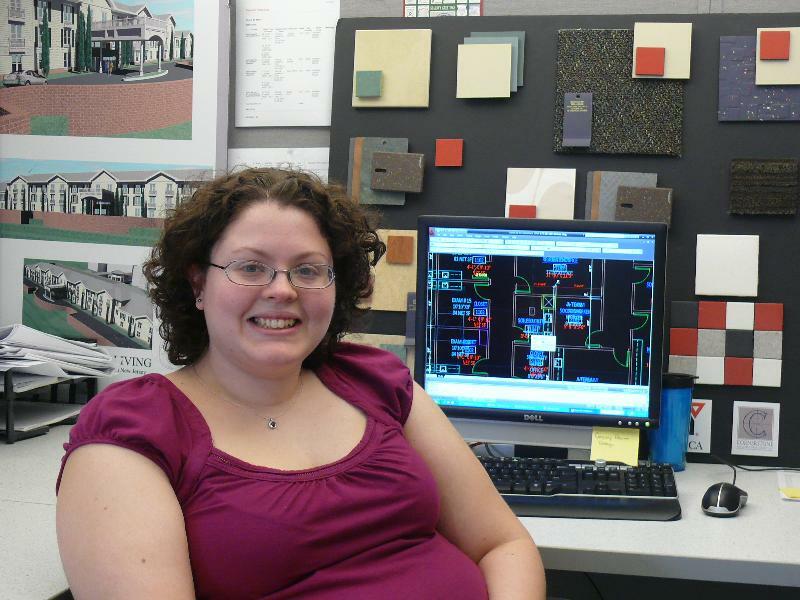 The Board also oversees and regulates the practices of Certified Interior Design and Licensed Landscape Architecture. 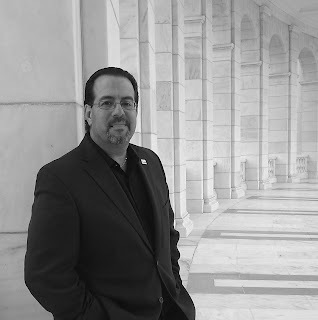 Additionally, in his capacity as NJ-SBoA President, Mike will also serve as New Jersey’s Member of the National Council of Architectural Registrations Boards (NCARB), and has been appointed to its National Intern Development Committee. The NCARB is comprised of the architectural registration boards of the 50 states and other jurisdictions. The mission of NCARB is to work together as a council of Member Boards to safeguard the health, safety, and welfare of the public at large and to assist Member Boards in carrying out their duties. The Council develops the standards and testing required of applicants for architectural licensure. After many years of need, two years of planning and 5 months of construction, the Kendall Park First Aid & Rescue Squad unveiled extensive renovations to its headquarters during a September 19, 2012 dedication ceremony. The facility, located on New Road in Kendall Park, is home to one of three first aid squads in South Brunswick. The squad has 45 volunteers and answers 1,800 calls a year, including three calls that happened during the dedication ceremony! Built in 1960, the two buildings that made up the squad became antiquated and too small to meet their current needs. A garage that houses two of their four ambulances was expanded 12 feet to its rear and 4 feet in the front to accommodate for the larger ambulances. Renovations also included a new higher roof, new HVAC systems, new electrical systems including an emergency back-up generator, and new accessible toilet and shower facilities for the EMS crew. The larger space also includes a meeting room and a full-size sink for cleaning their equipment. The Kendall Park First Aid & Rescue Squad collaborated with Cornerstone Architectural Group, S&K Construction and Magyar Bank to complete the necessary additions, alterations and repairs. The three companies worked together with the squad to keep costs as low as possible. The organization is a 501(c)3 charitable nonprofit and does not have a large amount of funds available. 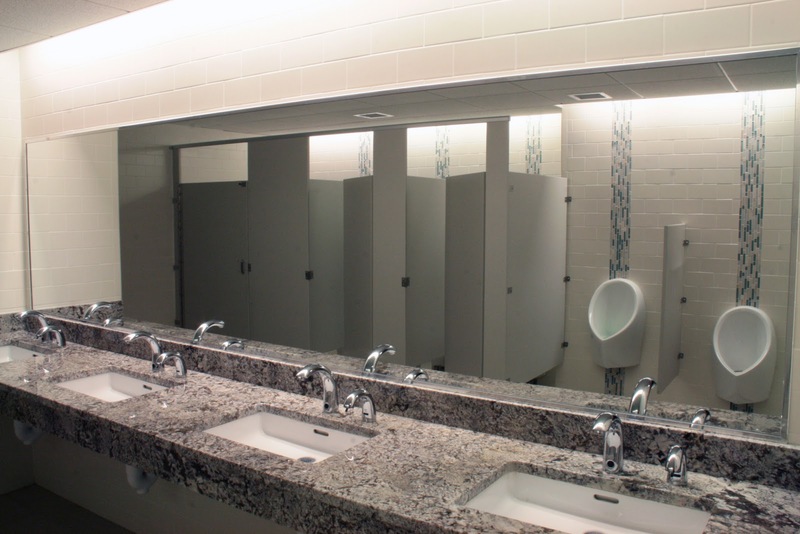 Michael Soriano, of Cornerstone helped design a solution to fully integrate the facilities into one cohesive unit. For more information on how to become a volunteer, or to donate, visit the squad’s website at www.kpfars.org. On the afternoon of Thursday, July 26th, Bob Barranger helped to coordinate and participated in the second annual Dairy Queen Miracle Treat day fund raiser to support The Children’s Miracle Network. More than 100 classic show cars were on display at the event held at the Diary Queen on Fisher Boulevard in Toms River, NJ. Bob and his son Bobby drove their 1967 Shelby GT 350 and 1966 Mustang GT to the event for display and were on hand to answer questions about these rare beauties. Face painting along with a magician and balloon artist helped the youngsters in the crowd celebrate the event. The children voted on their favorite classic cars, and trophies were awarded to their favorites. The Hawk 105.7 radio station was on site, broad casting live from the event. The event ran from early afternoon and into the evening hours. Through the volunteer efforts more than $2,500 in donations was raised to support the ongoing efforts of The Children’s Miracle Network Hospitals. Cornerstone has again worked closely with Associates in Cardiovascular Disease to assist them with the interior design for the 1.2 million dollar fit-out of their newest 10,000 square foot cardiac testing and examination medical office in New Providence, NJ. AICD is one of the most comprehensive cardiology practices in New Jersey. 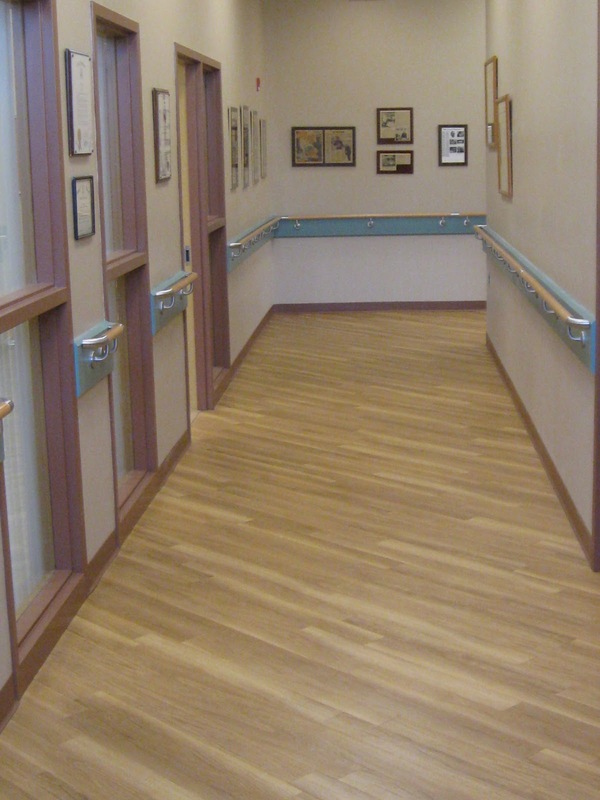 In 2007, Cornerstone worked with AICD on the interior design alterations and expansion of their medical office located in Springfield, NJ. Demolition within the existing facility is complete and the builder has now begun the new construction work. The interior design features wood grain flooring and built-ins with a new super energy efficient lighting design and control system. The building mechanical systems are to be upgraded and significantly renovated to provide zoned and fully programmable comfort for the staff and patients. Becht Engineering BT of Point Pleasant Beach, NJ designed the HVAC system in coordination with Cornerstone. The project is managed by Firm Associate, Marco T. Migliaro, Assoc. AIA, with supervision by Partner, Robert F. Barranger, AIA. 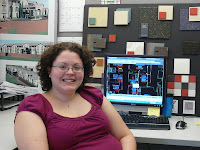 Interior design and the selection of finish materials were coordinated by Erin Jimenez, IIDA. 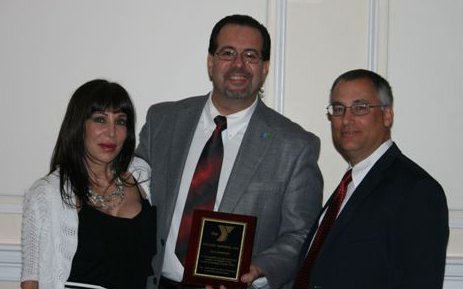 On Friday, April 13, 2012, the South Brunswick Family YMCA hosted its 12th Annual Gala Dinner & Comedy Night at Pierre’s Restaurant. 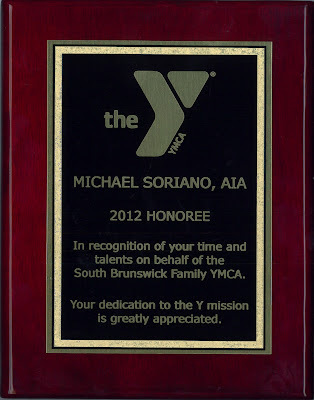 Along with the honoring of retiring Board President; Anthony Campisano, Cornerstone’s very own Michael Soriano was recognized and honored for his commitment, involvement and support of the South Brunswick Family YMCA and community. Mike Soriano is also well-known within in the South Brunswick High School band community, regularly supporting the band in various ways including his ‘expertise at grilling’ for their fund raising events. Over 175 people attended the annual event, which helped to raise $20,000+ for the YMCA’s Annual Support Fund, which provides free and reduce fee memberships and program fees for kids, families and individuals in need of child care, after school care and other health and wellness programming. 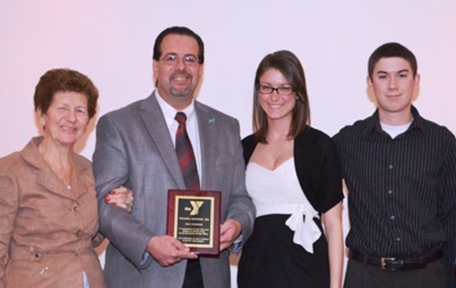 The South Brunswick Family YMCA, located Monmouth Junction, has been serving the communities of Jamesburg, Monroe, Plainsboro and South Brunswick since 1996. 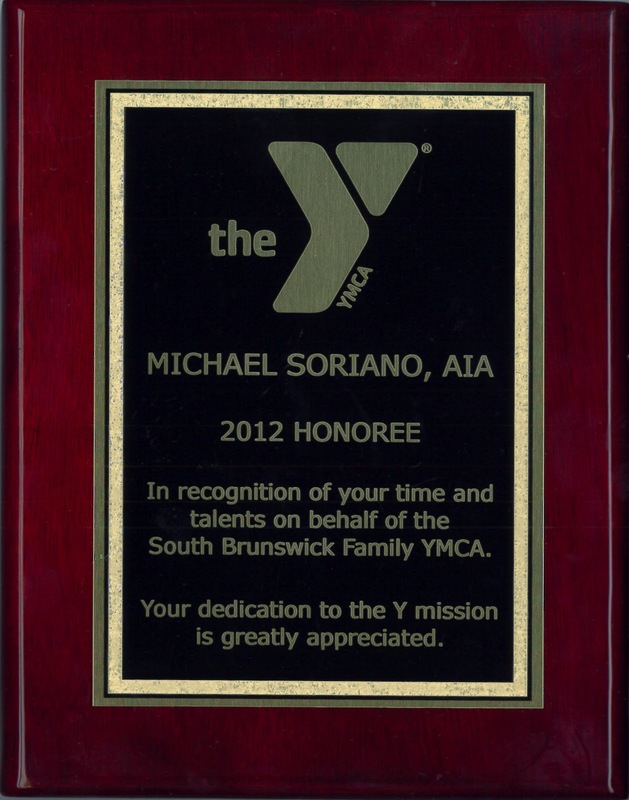 The South Brunswick Family YMCA is a nonprofit values based, community-centered, membership organization dedicated to enriching the spirit, mind and body through quality programming and services; including child care, after school programming, sports, aquatics, health and fitness classes, family activities, senior programming, personal training and summer camp. Over the past 12 years, they have continued to grow and expand programs and today reaching a membership that exceeds 1,550 local families, seniors, teens, youth and adults with more than 2,500 people using the facility on a regular basis. “We’re for Youth Development, Healthy Living and Social Responsibility”. More information may be found by visiting www.southbrunswickymca.org. For the 52nd year, the New Jersey Business & Industry Association and New Jersey Business Magazine will honor companies that have built, expanded or renovated commercial and industrial buildings that improve the economy as well as the landscape of New Jersey. It’s with great pride that we report that our client SHI International Corp. has won this prestigious award this year for their newly renovated building in Somerset, NJ. On November 10, 2011, special guests and friends attended the ribbon cutting ceremony celebrating the grand opening of SHI’s world headquarters building. New Jersey Lt. Governor Kim Guadagno delivered the keynote speech to the standing room only audience. SHI’s headquarters relocation to Somerset, NJ, brought with it 1,000 employees, with the potential for many more as the company continues to grow. 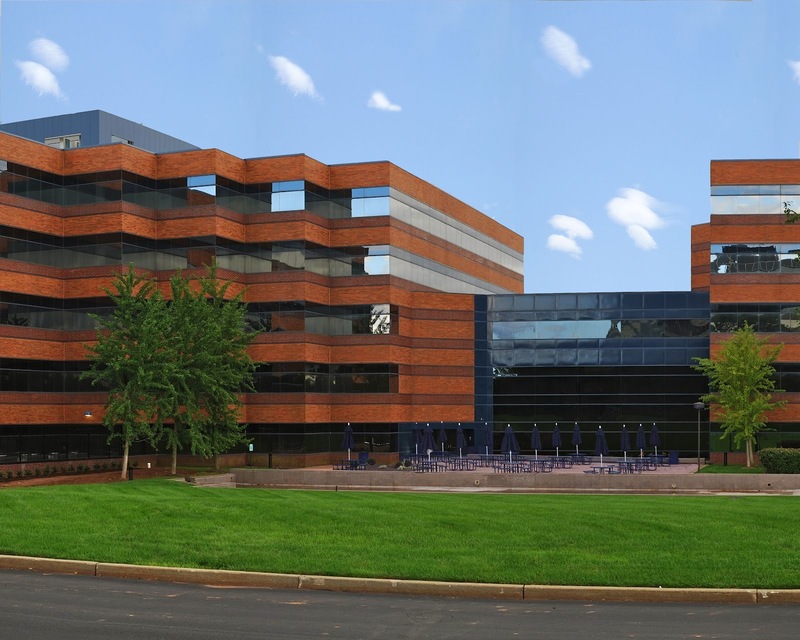 The SHI Integration Center is also located in Somerset, NJ, and includes another 100 employees. This will have a positive impact on the local business community for both services and products. Local hospitality, convention, restaurants and hotels are just a few of the local businesses that will see an increase in use as SHI settles into the community. It is estimated that over 500 construction jobs were created during the build out of the project that lasted for one year. SHI closed 2010 with $3 billion in revenue. In July 2011, SHI announced revenue of $1.8 billion for the first half of 2011. An increase of 33% as compared to $1.3 billion recorded in the first half of 2010. On October 25, 2011, SHI announced their third quarter revenues were up 29%. SHI recorded strong domestic and international sales growth in its Enterprise and Corporate Sales divisions, growing 25% and 103%, respectively. SHI opened a new $20 million cloud services data center that became operational in August, 2011. SHI will be using a series of best-of-breed, high performance components in their state of the art data center. The winning builders, developers, architects, contractors, engineers and other professionals involved in the projects will be recognized at the New Good Neighbor Awards Luncheon on June 1, at the Pines Manor in Edison. This is one of the state’s premier networking events for the design & construction communities. The AIA New Jersey Emerging Professionals Committee received a grant from The American Institute of Architects for their idea about a new mentorship program that facilitates interaction between professionals of all career stages. Mentorship is an essential feature of the development of an Architect’s career. The program – “Mentorship NOW” – utilizes today’s technology such as social media and promotes interpersonal communication to develop career relationships. Learning through mentorship has evolved from a narrow path to a complex range of possibilities. This organized program streamlines the current process into a more productive form of mentorship relevant to interns and students today that can also benefit seasoned professionals. 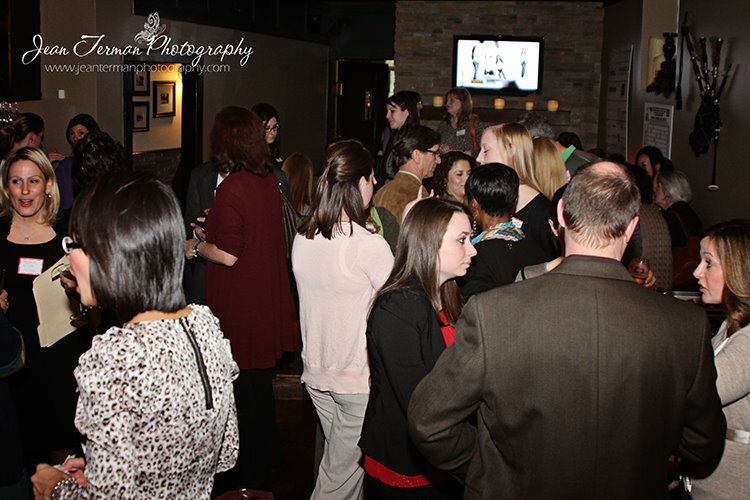 Mentoring groups will have four levels of professionals including emerging professionals, mid-level licensed, mid-level unlicensed, and seasoned professionals, who are grouped together through common interests. Fellows will be invited to participate, with the goal of one per group. Mentoring through cross-generational communication will facilitate bridging the gap between different experience levels. Groups will be assembled based on information provided in applications. As a supplement to the small mentoring groups, the committee will plan bi-monthly educational seminars where all are invited, featuring presentations given by professionals in other fields. Mentorship NOW will add educational seminars as another member benefit. These seminars will have AIA continuing education credits, which will encourage more to participate. Mentorship NOW anticipates launching this program in the late spring of 2012. The program is being organized by AIA NJ Emerging Professionals Committee which includes a Chairperson from each section, state IDP Coordinator, state Chairperson, Regional Associate Director, YAF Liason and Associate AIA members. Mentorship Now is also looking for professionals who are willing to volunteer time and teach seminars. If you are interested in doing this please contact Donna Miller at Miller@CornerstoneAG.com . As AIA National has recently made support of Emerging Professionals a strategic priority, now is the time to foster their development and welcome them into the Institute here at home in New Jersey. ‘The Scotch Plains September 11th Memorial is to memorialize the lives of those lost and to celebrate those who survived.’ Through local donations, the monument was built on the Alan Augustine Village Green and dedicated to the victims and to the survivors of the terrorist attacks of September 11, 2001. The monument features steel from the World Trade Center. Cornerstone Architectural Group is proud to have been asked to donate our time and talent to this most noble effort. 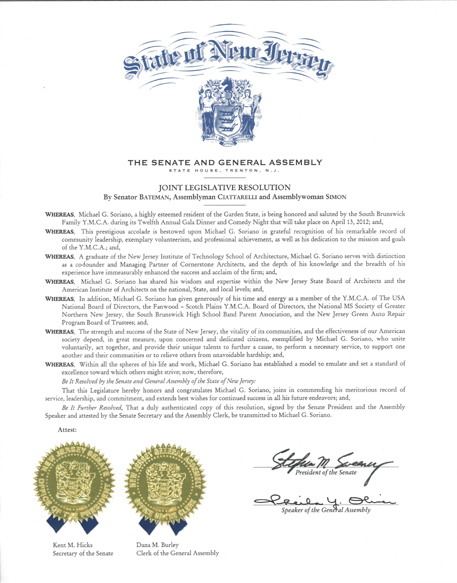 Thank You to the Township and to Scotch Plains Mayor Nancy Malool for your recognition. It was our Honor. The Neptune Township Department of Senior Services and Senior Center was recently dedicated and opened to the senior citizens of the Township. The new facility now provides a multitude of services and special programs within the extensively renovated 12,500 square foot facility. The design challenge? How to take a former Rite Aid Pharmacy building, repurpose it and then transform it into the new home for the seniors of Neptune Township, NJ. That was the challenge that the Township sought of our design team. Cornerstone partnered with Lifespan Design Studio of Loveland, Ohio to create an innovative design solution that exceeded the client’s needs. A soft earth tone color scheme created by Erin Jimenez, IIDA is accented by natural wood doors, handrails, simulated wood flooring. Project Architect Marco T. Migliaro, Assoc. AIA managed the project along with Partner Robert F. Barranger, AIA. Vito Tamborrino, Jr., AIA coordinated the on-site project activities during the build out. The new Center now boasts a full-service Commercial Kitchen, separate Fitness Activity Room featuring specialty athletic flooring, a large sub-dividable Multipurpose Room for lunches, group activities and meetings, a dedicated Ceramics Room and an Arts & Crafts Room. The Lobby with warm south-facing exterior glazing bathes this gathering space in natural daylight and features a masonry built-in fireplace as its focal point. 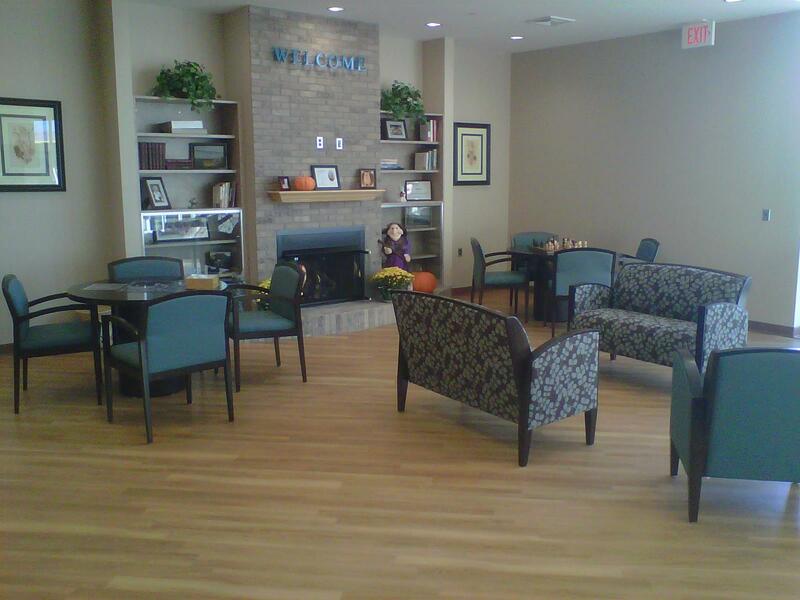 This newly created Senior Center project truly sets the bar for design for the aging! Last Phase of the Fanwood – Scotch Plains YMCA’s Master Plan is Finished! Six years in the making, the very last piece of the Y’s Master Plan was the renovation of the Fanwood – Scotch Plains YMCA‘s original 1970’s era natatorium. Work in this portion of the Y complex included demolition of the old ceiling and outdated mechanical systems. After new insulated roofing and windows were installed, a new state of the art Heating, Ventilation, Air Conditioning & Humidity Control system was also implemented, along with new high efficiency lighting and all new wall and ceiling finishes. Previous phases included the addition of a new two story building that houses a second competition swimming pool, a new child care facility, new Y program classrooms, administrative offices, and basement storage spaces, in addition to a new two level wellness center, and increased parking capacity. Completion of this last phase finally unifies the “new” look of the Y throughout the entire complex. Cornerstone Architectural Group is very proud to have been an integral part all of these projects and wishes the F-SP Y and all its members many, many productive years in their “new” facility. Cornerstone truly believes in the YMCA’s Mission ‘For Youth Development, For Healthy Living and For Social Responsibility’. Cornerstone Architectural Group is pleased to announce that Marco T. Migliaro, Associate AIA has been named an Associate of the Firm. Marco has a long tenure of employment at the firm since joining in 2001. He will continue to serve in his role as Project Architect, with client and project management responsibilities. He earned a Bachelor of Architecture from the New Jersey School of Architecture at the New Jersey Institute of Technology in 2005. He has completed the National Council of Architectural Registration Boards architectural internship at Cornerstone. 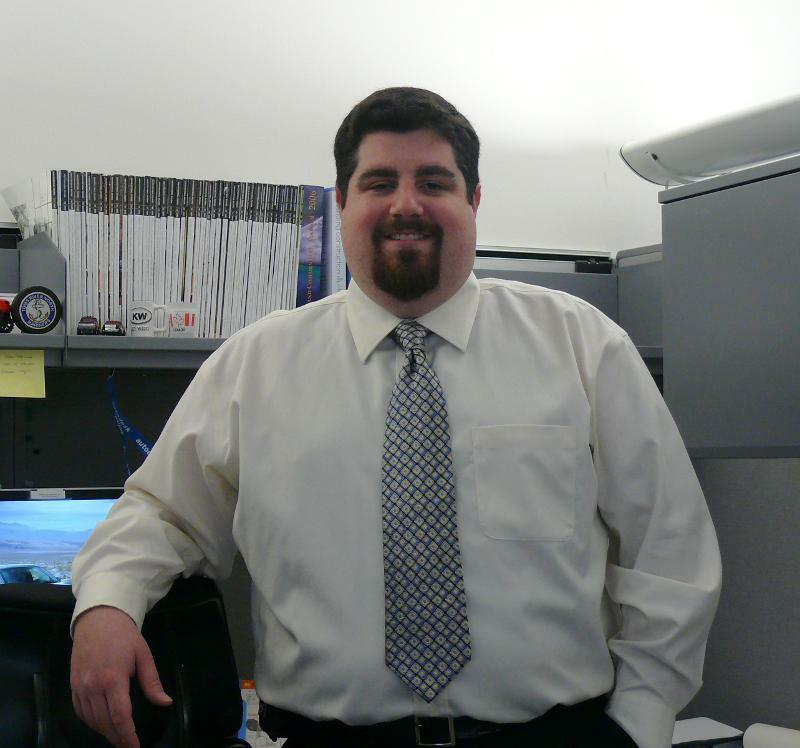 Marco has served as Project Architect for many of the firms notable and award winning projects, including design projects for the Township of Hillsborough, SHI International Corporation and AAA. He has managed projects of varying complexity and building type in several market sectors. He also has extensive experience in Information Technology systems and applications. He serves as the firm’s chief IT infrastructure manager. Marco lives in South Plainfield, N.J. with his wife and two pet dogs. Congratulations Marco! As hinted in our December holiday card, 2012 is a Milestone Year for Cornerstone Architectural Group. This year we will be celebrating our 25th anniversary in business and we are very proud of this achievement. 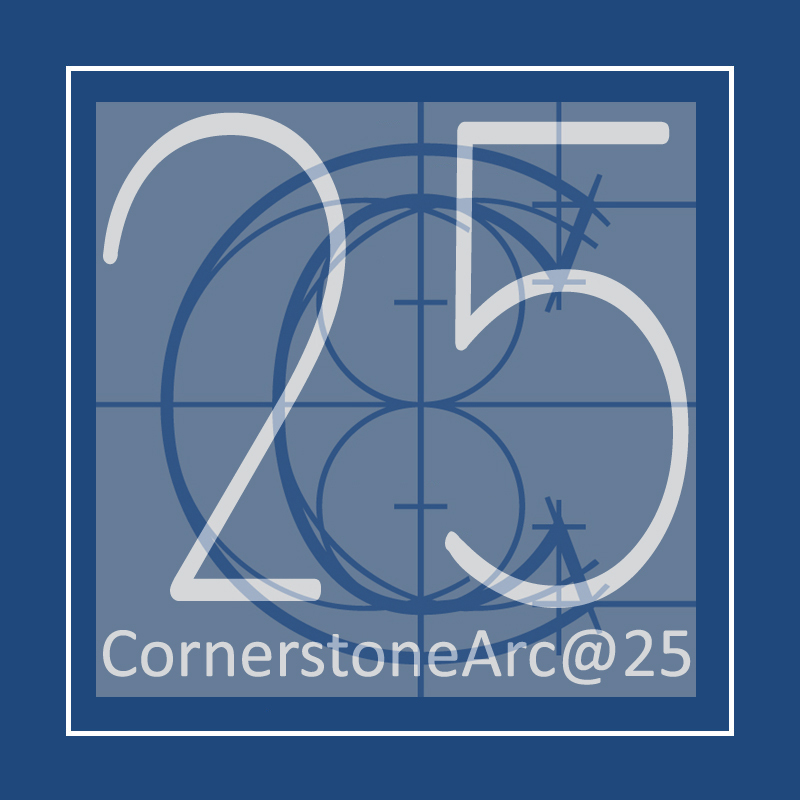 To mark the occasion, we will be using our new anniversary logo “CornerstoneArc@25” that you see pictured above, all year long. Additionally, we will be issuing periodic articles and anecdotes via our Quarterly Newsletter, as well as this blog, and and our social networking sites on Facebook and Twitter. We will be tracing the evolution of the firm and highlighting our team members, our clients and some of the significant projects that have helped Cornerstone become the successful firm it is today. We invite you to follow along with us this year and help us celebrate this milestone. We would like to thank our dedicated team members, our supportive families, and our trusting clients for the success we have had. We look forward to sharing this special year with you. 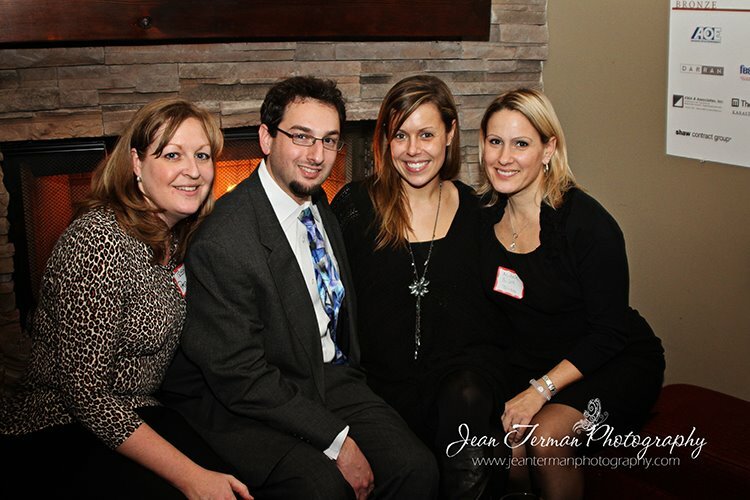 On January 31st, 2012, the New Jersey Chapter of the IIDA hosted their 2012 Winter Mixer, sponsored by Knoll. The event took place at Publick House, a quaint little restaurant in Mountainside, NJ, and boasted an attendance of over 50 designers, architects and vendors. The focus of the night was primarily to relay information regarding the upcoming fashion show. The group had a great night discussing ideas and catching up with friends and acquaintances while enjoying a wonderful selection of food and cocktails. Once again, this event goes to show that the new leadership of the NJ IIDA is gaining strength and interest in a once defunct region. The events that the organization is offering are getting bigger and better. “The Fashion Meets Finish: Raw Design” Fashion Show is a prime example. The upcoming fashion show will take place on May 17th, 2012 at the Stem Building, located on the campus of Kean University, and will showcase dresses designed and created by nearly 20 Architecture and Design firms in the area, using only the materials assigned to them. Visit the NJ IIDA’s Facebook page for more information regarding this and future events; on.fb.me/y9J0G0 . Cornerstone is proud of our very own; Erin B. Jimenez, IIDA, (2nd from the right pictured below), in her efforts along with her fellow officers of NJ-IIDA, to successfully bring renewed life back into the organization through their series of continuing education programs and social events. The IIDA promotes the interaction between Architects, Interior Designers and industry representatives. The mission of the chapter is; “To enhance the quality of life through excellence in interior design, and to advance interior design through knowledge, value and community”. For SHI, our goal of design was to create an atmosphere that accurately represented the company, and reflected its unique personality. The use of color, texture, shape and lighting allowed us to convey a design character unique to SHI; one that makes a statement and reflects the company’s image. The initial inspiration for the design at SHI was the headquarters of Google.com. The multiple colors and open space plan seemed to capture much of what SHI was looking for in a direction of design. The fun, collaborative atmosphere was appealing and well suited for this fast growing software company. The overall design and the flow of the space were to encourage teamwork and collaboration. The open office design of the space keeps the employees feeling connected, collaborative and in touch with one another. The bright colors and fun patterns that are accented throughout the building reflect a friendly atmosphere and a happy and productive work environment. The intention of the reception area was to give a first impression that was accurate to the image of the company, which we were very successful at conveying. 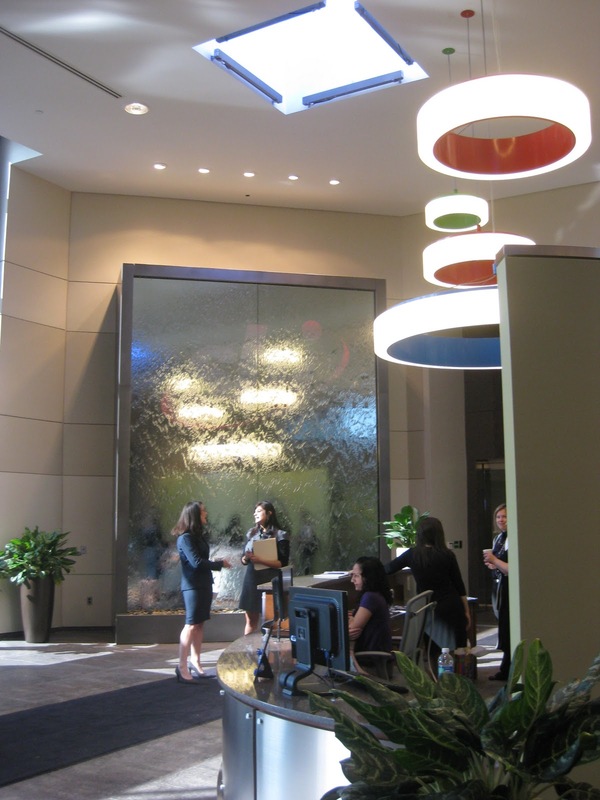 The use of several colors and shapes, as well as textures and surfaces, allowed us to create a techy yet sophisticated reception and lobby area. 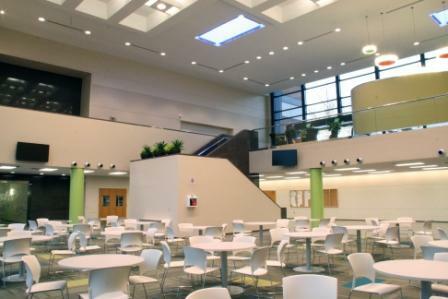 Since the reception area is a mezzanine open to the atrium below, there was a need to address some acoustical issues, due to the fact that the Atrium will be used as a gathering space once the cafeteria is completed. Each floor consists of two pantry areas, which give the employees an opportunity to bring their lunch or daily snacks, and not have to waste time in leaving the building to eat. 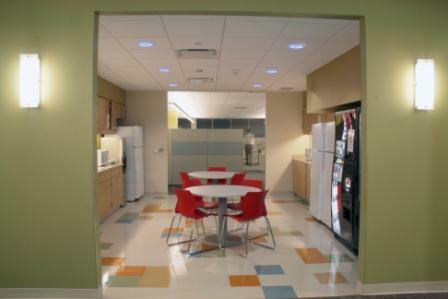 The random floor pattern and warm colors of the space make the pantries an inviting place to eat and collaborate. We made sure to provide ample storage with both cabinets and drawers, so as to house the paper products and cutlery that SHI provides for the employees. Each pantry is also equipped with vending machines, water coolers, and microwaves. Each floor also consists of this conference room prototype. 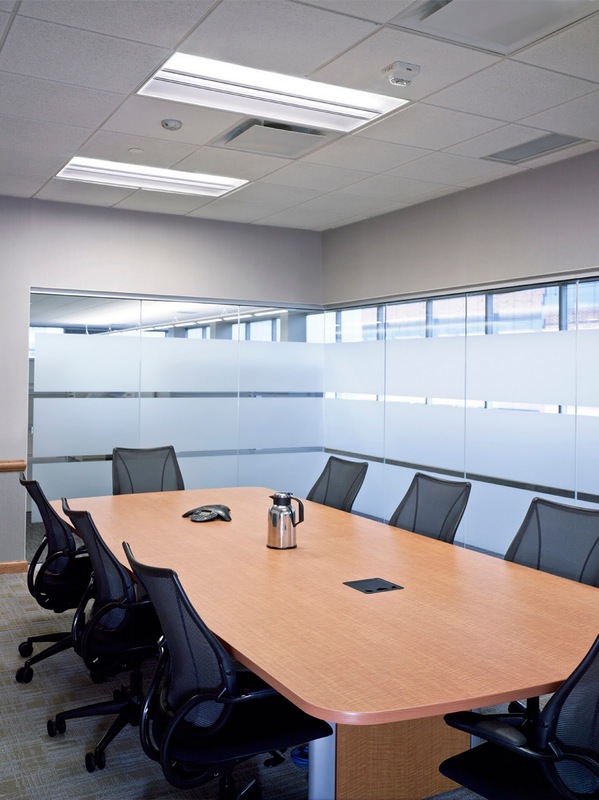 The intention of this room was to provide each quadrant of the office space with a formal conference room. The storefront design allows for the space to feel open and collaborative to the rest of the work area, while the frosted striping on the glass offers just the right amount of privacy for the meeting attendees. The full glass walls allow for natural light to flow through the space, which would normally not receive the benefit of natural sun light with traditional walls. The open office space was designed with the intention of keeping the space as open and collaborative as possible. 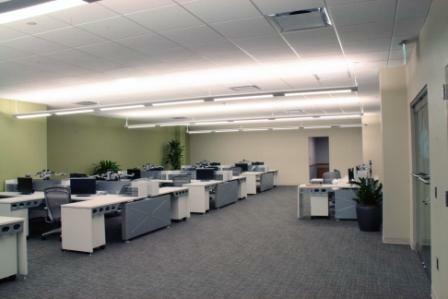 The low work stations promote communication and collaboration amongst the employees. 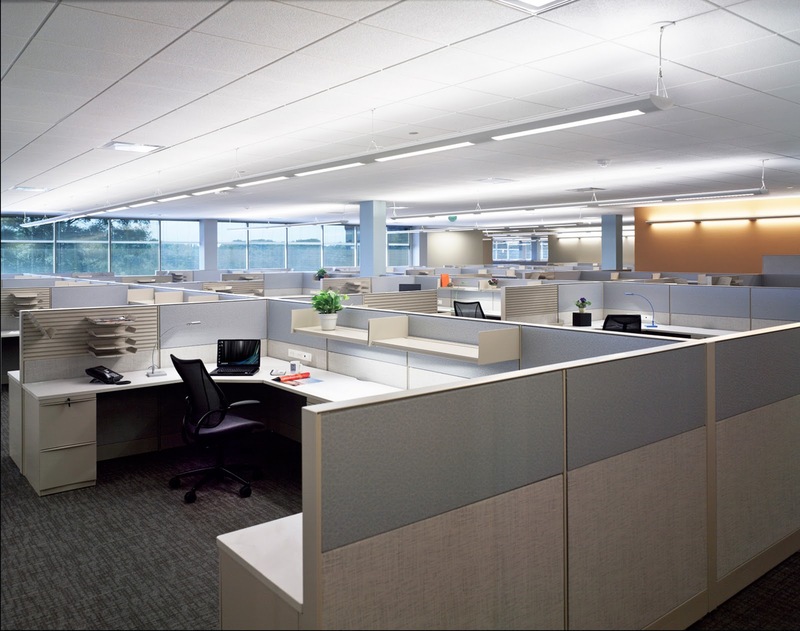 This set-up also allows for natural light to travel through the space, to the benefit of every employee. The offices in this building were intentionally designed to be located in the center of the space, instead of along the perimeter of the building, so as to free up the window area for all to enjoy. Because of the vast size of the space, we used color accents to differentiate the different areas and make it easier for employees to recognize where they are at a glance. The accent colors on each floor provide the employees with way finding and allow them to easily determine what area they are in, which can prove challenging in such a large environment. 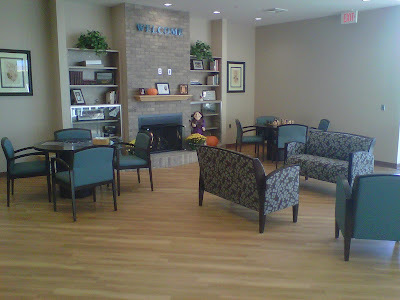 Accent colors were also used in alcoves to distinguish the types of services that are located there. 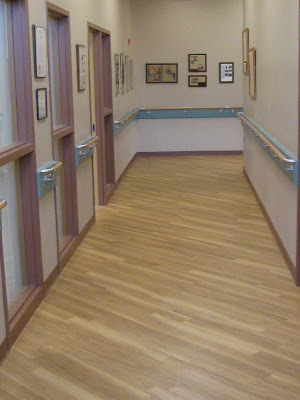 Restrooms, mechanical rooms, stairwells, IDF and janitors closets were color coated to equip employees with at-a-glance way finding. All of this is designed in an effort to increase productivity and decrease wasted time. The intention of the color scheme in the stairwells was to keep them fun and inviting, so as to encourage the employees to travel via the stairs, rather than the elevator. 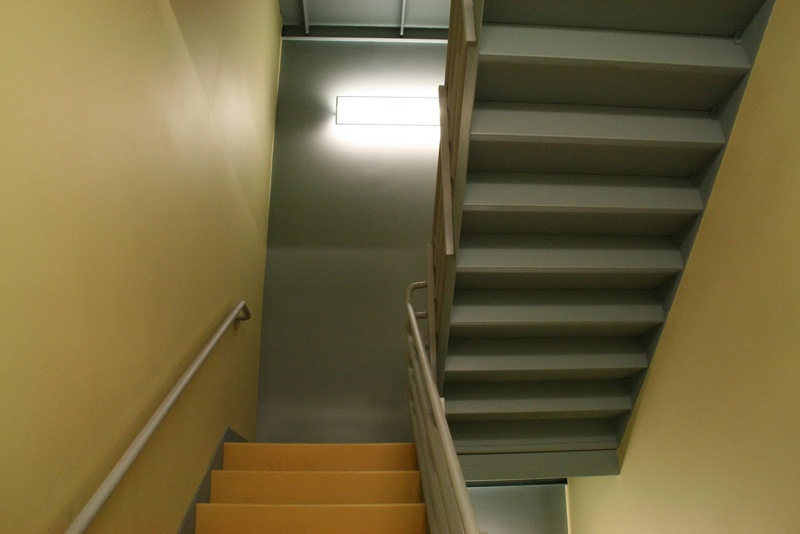 The stairs could be especially discouraging to those employees that need to travel 5 floors at a time. So, our focus was to making these stairwells as appealing as possible. The building is a successful interpretation of the personality of a successful company. The design will continue to inspire and encourage employees and begin to brand the company with a unique look to a productive environment. The new world headquarters for SHI International Corporation has been an exciting and significant project for both the client and for Cornerstone Architectural Group. This project signifies tremendous growth for our client and a physical representation of their dedication to sustainability with their first Leadership in Energy and Environmental Design (LEED) certified headquarters. It is also the first LEED project designed by Cornerstone Architectural Group. Cornerstone Architectural Group has been involved with the LEED process for SHI International’s new headquarters since the beginning, sparking the client’s original interest in LEED. The initial presentation made by the design team included a list of achievable points based on the Cornerstone’s design standards and characteristics inherent in the existing building. The project consists of building infrastructure upgrades and a 220,000 square foot interior alteration that anticipates LEED Commercial Interior (CI) Silver certification. The design includes sustainable strategies such as: an energy efficient lighting design, naturally lit open offices, occupancy sensors, water efficient plumbing fixtures, low VOC finishes, zero irrigation landscaping, and a 500 kW photovoltaic array that will be installed end of 2011/ beginning of 2012. The team took sustainability and air quality even further and instituted construction waste recycling, a paperless submittal process, and the creation of a tobacco free campus. 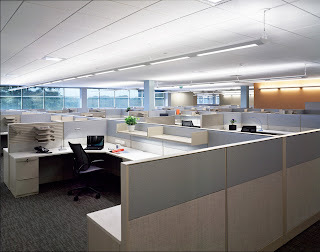 The most successful design strategies implemented were the energy efficient lighting design coupled with the naturally lit open office space, and the water efficient plumbing fixtures. The existing building consisted of open office floor plates with central cores and ribbon windows around the perimeter, allowing natural light deep into the space. The design team took advantage of this and kept the plan open, with private offices into the corners of the plan, allowing natural light into both the offices and open office spaces. The energy efficient lighting design included direct-indirect lighting fixtures that were centered over the open office furniture, as well as a task lighting component. This allowed people to customize the light level in their space. This lighting design was mocked up for the client to ensure them that there would be comfortable lighting levels. The lighting design resulted in a 35% reduction in the lighting power density. The water efficient design for SHI International allowed the team to anticipate a 40% reduction in water usage. This was achieved by using low flow toilets, waterless urinals, and automatic sink faucets. This design is anticipated to achieve 12 points toward LEED Silver Certification. Outside of the design aspect of this sustainable project, Cornerstone Architectural Group coordinated the design team, set goals for the LEED Certification, and kept the team on task with these goals. We also coordinated the construction staff, and made frequent site visits to ensure that the intent of the design was being carried out. In continued sustainability awareness, Cornerstone Architectural Group will be teaching a course to SHI International’s facilities staff about sustainability and the LEED GA exam. 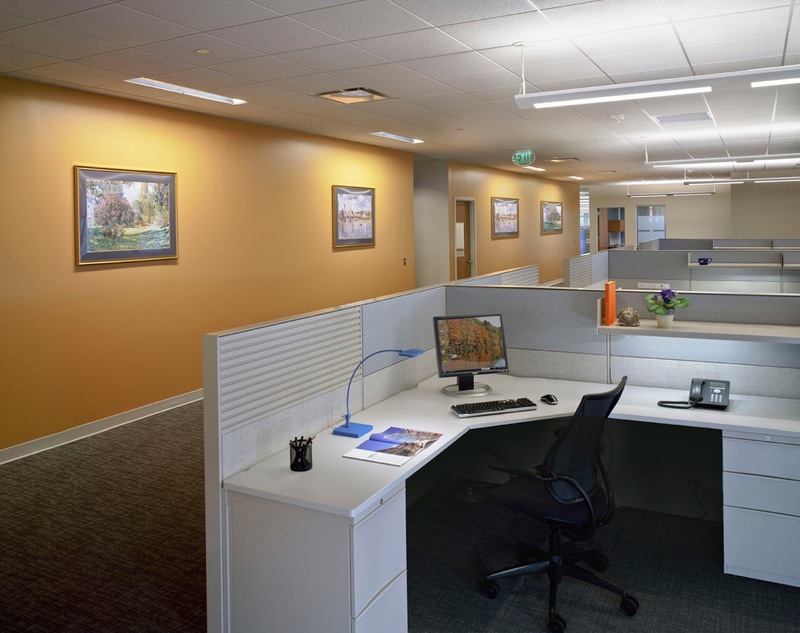 For the past year, Cornerstone Architectural Group has been an integral part in designing and implementing the fit out of the SHI International Corporation’s world headquarters in Somerset, New Jersey. 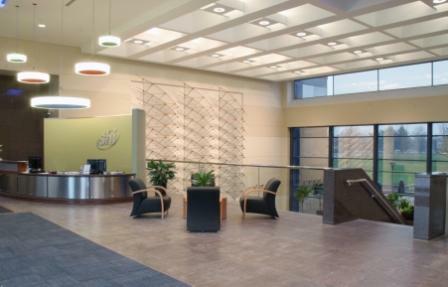 In 2007, Cornerstone had been part of the design and construction management team that had created SHI’s previous headquarters in Piscataway, New Jersey. Since then, SHI outgrew its space and again turned to Cornerstone to help master plan for their current and future growth. Deemed to be one of the largest fit-out projects in the Tri-state area, SHI wanted a space that was open, employee-friendly, and environmentally sound. 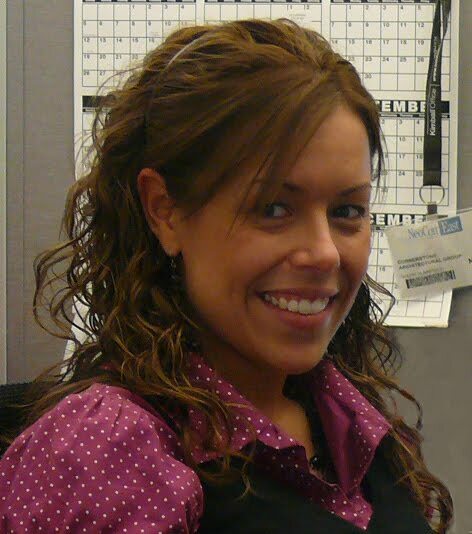 In addition, Cornerstone was presented with the task of anticipating future job force growth within SHI’s workforce and worked closely with each department’s managers to ensure space planning and anticipated growth needs were appropriately met. Much of the interior space in the new headquarters was set aside to be utilized as open office space. Part of this design concept centered around keeping the focus on the existing structure’s ribbon window design to allow for natural light to stream into a majority of the office areas. Cornerstone utilized a revolutionary lighting design that involved spreading the direct/indirect lighting sources to an unheard of 18-foot on center spacing. This allows the light fixture to be over every spine of the furniture system and allowing light to be placed on the functional work surface. This design, along with personalized lighting systems, allowed Cornerstone to provide employees with the appropriate lighting but also enabled an eco-friendly decrease in the amount of electricity being consumed. A majority of the open work spaces were kept in the central portion of the building to allow for the open floor plan, while private office spaces were cut out from the existing saw-toothed areas of the building’s structure. The Cornerstone design team attempted to utilize and integrate as many of the building’s existing strengths to create a plan that addressed the client’s needs but allowed for the minimal amount of demolition to the building’s original partitions. One of SHI’s main needs was to have an ample amount of meeting spaces, a need that was magnified as the company has grown. 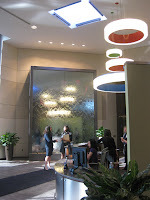 The demand for formal, informal, and quick gathering places was met by integrating a large number of conference and meeting spaces into the design on every floor. In addition to adjusting the layout to serve the client needs, Cornerstone completely revamped and replaced the building’s entire infrastructure, including new chiller plants, cooling towers, building control systems, fire alarm system, and roofing system. The SHI project was not only focused on designing office space, but several other unique amenities and services to serve the unique needs of SHI’s work force. 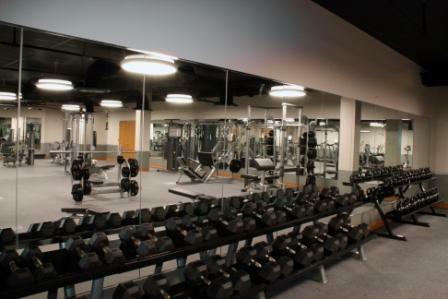 A 3000-square foot gym facility was included in the fit out and includes a free weight area, machine space, and group exercise room. A comprehensive 3000-square foot Café was designed to serves nearly 1000 employees for 2 meals a day and includes bistro-inspired finishes and state-of-the art kitchen amenities. A specialized healthcare clinic as well as several mothering rooms were integrated into the design plan to meet the diverse needs of the staff and their families in order to make a wellness-focused place of employment. In keeping with the wellness-centered philosophy, small details such as a marked walking path and exterior basketball areas were an integral and important portion of the building design. Bright and fun colors liven and enrich the exit stairwells, encouraging employees to utilize the staircases instead of taking the elevator in the 5-story building. As the project architect, Marco Migliaro Assoc. AIA, was involved from start to finish of this nearly year-long process. With this project having many phases, Marco managed the four main project phases which included the infrastructure upgrades, roof replacement, fit out, and SHI cloud data center. He was also intimately involved in coordination of services between the project manager (Jones Lang LaSalle), building systems engineering firm (Becht Engineering BT), civil engineering firm (The Reynolds Group), as well as the coordination of three different contractors, including Tuner Construction, Unity Construction, and Strober-Wright Roofing. Marco was on-site for a majority of the project in order to provide site-based problem solving and design coordination, as well as being a continuous resource for the client. Another unique aspect of this project was utilizing a paperless system of coordination and communication. This was accomplished by using online resources and web-based services such as Dropbox and Submittal Exchange. Submittal Exchange is an online service that provides a portal for submitting everything from RFIs, submittals, and close out documentation. This service automatically tracks and logs all items and sends out emails to all involved parties, including clients, the architect, consultants, contractors and even subcontractors. In addition, all drawings were completed in a DWF format, which is an AutoDesk file similar to a PDF but more practical for architectural application. Cornerstone and SHI have had a great working relationship and Cornerstone looks forward to future projects in 2012 and beyond, which include a customer briefing center and future fit outs of the remaining office space. This project has been a unique opportunity that has allowed Cornerstone Architectural Group to utilize state-of-the art communication, unique design concepts and environmentally-forward building materials to meet the needs of a technology-forward company.